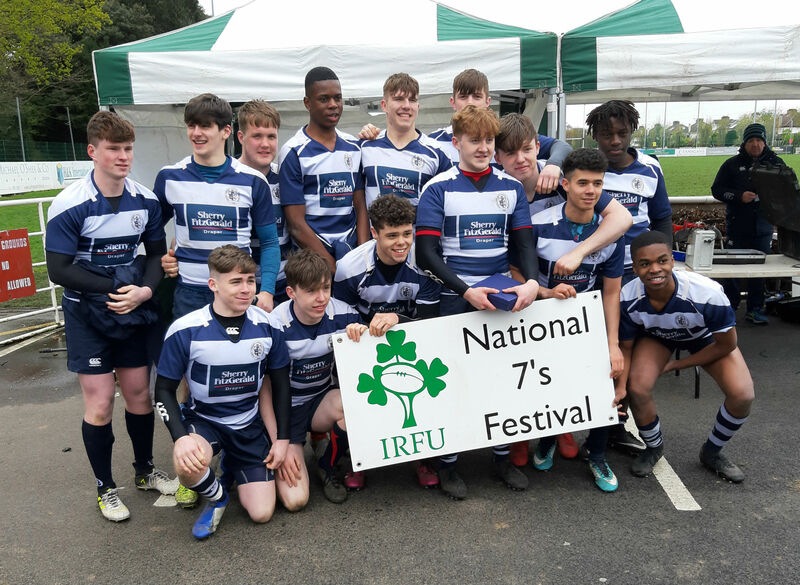 On Wednesday 3rd April the Sligo Grammar School U18s won the Plate in the IRFU National Sevens Rugby Competition. In the quarter final they defeated Bandon Grammar School, Munster Senior Cup Semi-Finalists, by 6 tries to 2. In the semi-final they played Castletroy College, Limerick, and, after going 14 – 0 down, SGS came back to win 19 – 14. The turning-point of that game was a try scored and converted by Hubert Gilvarry, just before half-time. Two minutes into the second half Mark McGlynn got a break-away try which was converted by William Whelan, to tie the score 14-all. In a nail-biting finish, following a sweeping move involving all players, James Whelan finished in the corner with a one-handed try, to give the Grammar School victory. In the final they faced Newbridge College, Leinster, whom they defeated 36 – 14. This game was never in doubt after a blistering start when Fiachra Staunton scored a try after making a break from 40 metres out. This was quickly followed by a try from James Whelan which was converted by his brother Will, bringing the score to 12 – 0. Almost immediately after this Fiachra Staunton broke through again and scored under the post. From the re-start Kacper Palamarczuk caught the ball and, with help from Matthew Earley, set up a ruck where the ball was moved quickly by Andrew Ward out to Hubert Gilvarry who scored the Grammar School’s fourth try of the half, to bring the score to 24 – 0. Just before the break Newbridge scored and SGS continued to dominate thanks to two further tries from James Whelan, with Newbridge getting a consolation try towards the end. The Grammar School had made 5 changes by this time, bringing on Joseph Asare, Matthew O’Hara, Lucas Codyre, Sean Ndego and Mark McMcGlynn. Overall this victory today was achieved by a great team performance from everyone on the panel. The squad was: Joseph Asare, Sam Atumonyogo, Lucas Codyre, Matthew Earley, Jacob Fleming, Hubert Gilvarry, Mark McGlynn, Sean Ndego, Matthew O’Hara, Kacper Palamarczuk, Fiachra Staunton, Andrew Ward, (Captain), James Whelan, William Whelan.